There’s always a lot of confusion floating around the Z32 world, and many other communities, regarding the names of different turbos used for our cars. One important thing to note is that very few companies actually manufacture turbos. In the Z32 world, virtually every turbo (with a handful of exceptions) are Garrett turbos. The stock turbos were by Garrett, so it’s easier to upgrade to higher-performing turbos from Garrett, than starting from scratch to adapt a completely different turbocharger to fit the car. Plus, Garrett turbos are super reliable, which is why many OEMs (including Nissan) choose to use them on their cars. First, let’s talk about how the Garrett turbo’s name is made up. We’ll use the GT2560RS as an example. 25 refers to the “frame size” of the turbo, based on the turbine wheel inducer (the inducer being the top of the blade). 60 refers to the compressor exducer size, in millimeters, of the compressor wheel. So in this example, the 60 means the turbo has a 60mm compressor wheel exducer diameter. R indicates that the turbo uses ball-bearings, rather than journal bearings. In the 300ZX world, this also means it will require 5 bolt downpipes rather than 4 bolt. S is rarely found on our turbos, but it basically means the turbo has been slightly modified for a special application. In this example, the GT2560RS has an inconnel compressor wheel, and a separator built into the turbine housing, much like those found on 300ZX “split” downpipes. Some newer turbos will also have an “X” in the name. The GTX turbo is Garrett’s latest generation. The changes consist of a billet compressor wheel, which means they are constructed with a thinner “root”, allowing for larger blade surface area without changing the compressor wheel size. However, the height is often increased, the “tips” of the blades are extended further into the compressor housing for greater surface area, and most compressor wheels have switched over to an 11 blade design, rather than the 6×6 (6 big and 6 small) blade design that earlier turbos use. GTX compressor housings also feature “anti-surge” ports. So when you find a turbo kit for the 300ZX, it is almost always a Garrett turbo which has been adapted to fit the 300ZX and given a special name. But aside from that, the actual turbo is still a standard Garrett turbo. Here are a few examples. Z1 600RS —> GT2560R (not to be confused with JWT Sport 600s, which were a journal bearing turbo). To add to the confusion, there are various turbos with nicknames. Many refer to the GT2560R turbo as the “GT28R,” which makes no sense to me personally, but it’s extremely common. The GT2860R is also commonly referred to as the “disco potato” (long story), but I rather enjoy that one! Regardless of the name, the most important thing to consider when choosing a turbo is the application. It’s often tempting to go straight for a big turbo setup for high horsepower, but keep in mind that a larger turbo will be laggier, so for a street-driven car that’s not always a good choice. It’s generally not recommended to go higher than a GT2860R for anything other than a dyno queen. For a track or street car, smaller turbos like the JWT 530 or 550 are ideal. Something like the GT2560R is right in the middle; it actually spools about the same speed as a GT2860R, but can’t produce as high top-end power. However, when breather mods are added, the 2560’s spool-up characteristics improve dramatically. I put together a quick chart to give people an idea of where all these different turbos fall in relation to one another. Please keep in mind, there’s no set scale here, it’s just a visual representation. Things get a little more complicated when you add other mods into the mix, but consider this a general rule of thumb for a turbos power vs response. When upgrading turbos, it’s a really great idea to also upgrade to MSP Manifolds, and add in breather mods (like 2.5″ intercoolers and intercooler piping). Even stock sized turbos can see really significant gains from these two upgrades alone, and the stock piping and manifolds truly become restrictions with larger turbos on high horsepower builds. 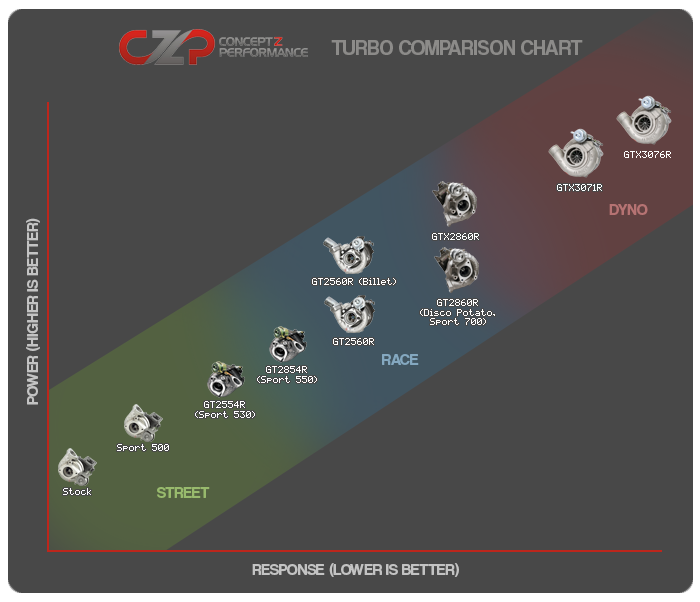 I know this article is a bit old and the chart is for relative comparisons only (love the chart btw), but why is the GT2854R (Sport 500) shown to have less power and better spool up than the GT2560R? Is that a typo in the chart? The billet version of the GT2560R I could maybe understand but all else equal it seems the GT2854R should be a bit laggier than the GT2560R. Just wondering. The 2854s (those are Sport 550s, btw) just spool up exceptionally quick, I think most likely because of the smaller compressor size. The smaller compressor is also why the 2560s make more power.